Collaborate (also known as Collaborate Ultra and Collaborate with the Ultra Experience) is a collaboration tool that allows students and instructors to collaborate in real-time with video and audio. For purposes of the resources and information in this article, all references to Collaborate are specific to Collaborate Ultra and not its Java-based predecessor. Important: At this time, Google Chrome is the supported browser for Collaborate Ultra. If you are the instructor of a course, you should enter Collaborate through your course. Collaborate will most often be accessible via a course sidebar link, Collaborate. If you are invited to another faculty member's session, please refer to our student-focused article, which is geared toward invitees. To get started, either use the default Course Room, or create a new session. Collaborate comes with one default Course Room. This is always available, but has default settings and can be adjusted. To access the default Course Room, click the Join room button. Join Your Course Room: The course room is an open session dedicated to your Blackboard course. Select Join room to join the session any time. Create New Meeting Sessions: Select Create Session. Add the name, date, and time of your meeting. You can also decide if you want to allow recording downloads (before the session begins). Time zones in Collaborate are set automatically based on your computer's time zone. Update Meeting Information: Need to adjust the time or date, or invite a guest? Edit the session’s information using the contextual menu on the right. Start Your Meeting: Click the name of the meeting to join the session when you are ready to start. View Recordings: Select Recordings to view your recordings. You can now call into a Collaborate session without joining the session on a browser. From your list of sessions, select the name of the session you want to call into. Select the Anonymous dial-in information from the menu. Use the provided Anonymous dial-in information to call into a session, or send this information to your participants for them to call into a session. Tip: If you set up an open-ended session, you can reuse the same Anonymous dial-in information for your participants in your invitation to them without change. Within your Session Settings, you can adjust the roles of participants and guests. Review the brief descriptions below for each role to ensure the roles of your session's participants are set accordingly. Moderator: Anyone enrolled as an instructor in the course will receive the status of Moderator. Instructors in Blackboard courses will always be moderators. Moderators have full control over all content being shared. They can make any participant a presenter or a moderator. Moderators see hand raise notifications and can lower hands. They can remove participants from a session, but they cannot remove other moderators. Moderators can set the session settings, including deciding what participants can and can't do. Participant: Anyone enrolled as a student in the course will receive the status of Participant. Participants can interact with any enabled collaboration features, such as chat, whiteboard editing, and audio/video sharing. Presenter: Participants can have their roles elevated to Presenter, which gives them the ability to share content freely. You can manage permissions either before the session, or during the session. Mute participants or promote them during the session, too. If you have been invited to someone else's session, or have been given a direct link to a session, you may have different permissions than you outlined in this article and should refer to our student-focused article, which covers functionality in Collaborate from a participant's angle. Getting setup with Collaborate is easy. No applications to install or added software is needed. When using Chrome, Flash is not required. Complete the first-time access audio/video setup for the best experience. You will be prompted to complete this step. You will receive the role of Moderator for your personal Collaborate Room. Moderators can control various components of the session, including muting the audio for users, starting and stopping recordings, and more. Use the buttons in the toolbar at the bottom of the screen to share your video and audio. More features are available in the expandable panels in the Session Menu and the Collaborate Panel. Upload images (GIF, JPEG, PNG), PDFs, or PowerPoint presentations of 60MB or smaller to your session to share with your meeting participants. Select the Share Content icon. Select the Share Files button. Click Add Files Here or drag a file into the box to upload it. Next, click Share Now to share the file with your class. Tip: If you have multiple files, a navigation panel will be available on the right, allowing you to easily switch between files you’ve uploaded to your Collaborate session. With PowerPoint Presentations, a slide navigator panel expands, providing a thumbnail list of your slides. Important: Shared files remain in the session and may be viewable by others until deleted. Select a slide to start sharing it. Indicated by the purple highlighting on the first slide in the navigator. To delete a file, click the wastebin icon to the right of the file name in the Share Files pane. Use the Whiteboard tools to mark up the shared files as you and your attendees desire. Application sharing can be utilized with your desktop computer programs. To share a Microsoft Word document, open the document on your computer and use one of the options below. Select Just an Application from the resulting screen to share a specific application (ex., an open Word document). Your application must be open (do not minimize) to be viewed in the Share Your Screen application selection window. Select the desired application from the tiles presented and the Share button. Tip: If you encounter a green screen, try sharing your Entire Desktop. Record your meeting and send the recording’s link to your attendees or to those who missed the meeting. Expand the Session Menu pane by clicking the hamburger menu in the upper-left corner of the Collaborate interface. To start the recording, click the Start Recording button at the top of the Session Menu pane. To stop the recording, expand the Session Menu and click the button to Stop Recording. Chat with your participants without taking the focus off the speaker. React with an emoji. Click the chat bubble to open the Chat pane. Enter text, or select an emoji. Customize your chat notifications in My Settings. Prefer to use your phone for your session’s audio? Collaborate Ultra has a phone bridge that can serve this purpose. Select Use your phone for audio. Call the phone number listed and enter the unique PIN provided for your session. Use the Whiteboard tools to markup a blank whiteboard, or markup shared content in real-time with your session attendees. Draw lines, highlight sections of a shared document, annotate a graph. From the Share Content options, select either Share Files or Share Blank Whiteboard. The tools available will be displayed in the upper-left portion of the interface. Options include, text, pencil, shapes, and the ability to save the annotated content by right-clicking on the area and saving. Collaborate Ultra is different from the Java-based Blackboard Collaborate that you may have experienced in the past. No Java installer or launcher application is required and, when using Chrome, Collaborate should seamlessly load into a new tab on your web browser. Use the information below to ensure you have an ideal experience. Certain critical functionality is only available when using Chrome as your web browser. Use Google Chrome as your browser for all Collaborate Ultra interactions. At this time, Chrome is the only supported browser for Collaborate Ultra. Critical functionality for Collaborate is only available within the Chrome web browser. Experiencing connection alerts or missing elements of the session? Collaborate uses your connection speed and quality to determine what can and cannot be viewed without interruption. If you are on a slower connection, the video stream may be stopped so the audio can proceed without interruption. Use Chrome as your web browser. Install the Chrome extension Desktop Sharing. Use this recommended process from Blackboard. Problems with your audio or video? Follow the setup as outlined for audio and video. Blackboard has some helpful tips on troubleshooting audio and video issues. Mute your audio or hide your video to see if the connection/quality of the session improve. Use a headset to reduce external noise coming from your end. Mute your microphone when you are not actively speaking. Students are reporting they cannot share content within the session. Ensure the students who need to present content (share files, applications, etc.) have the role of Presenter for the Collaborate session. 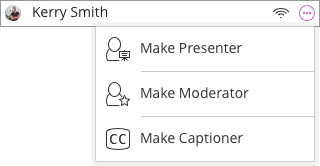 Promote users from Participant to Presenter within the Collaborate session.